You had your weekend all planned out. Go to the gym, call your parents, finally buy those lightbulbs you keep forgetting to pick up. Productive stuff. Then you get a text message with a picture of a mimosa that says “Brunch?” And all of a sudden, those plans went right out the window. Now the only problem you have is deciding where to take your precious day off to day-drink and stuff your face with pork and eggs. 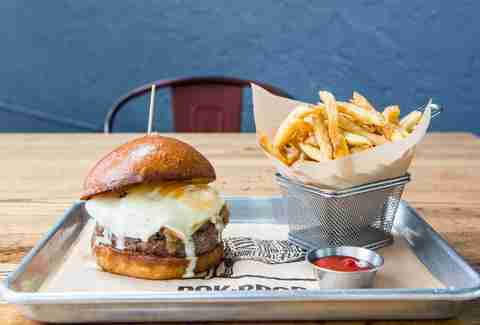 To help narrow down your choices, we found the best brunches in 13 South Florida neighborhoods. Another mimosa, please. Though you might think to avoid this place on weekends in the fall since it’s typically teeming with Gator fans, the brunch is worth dealing with their incessant chomping. 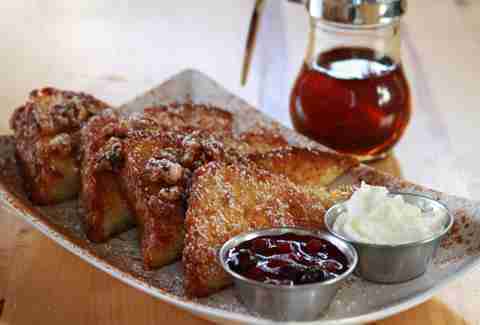 Get the drunken peach toast with dark rum maple syrup or the fried chicken and waffles with green tomato jam. Wash it all down with bottomless sangria, mimosas, or Bellinis for $20. Perhaps the best brunch combination of view/food in all of Miami is on the ground floor of the Mandarin Oriental. Here you’ll find Peruvian anticuchos plus sushi, ceviche, and mains like lomo saltado. Add to that unlimited brunch cocktails, beer, and Champagne, a literal house of desserts, and a waterfront seat overlooking the Brickell skyline and you’ve got all the ingredients for the perfect start to a Sunday. 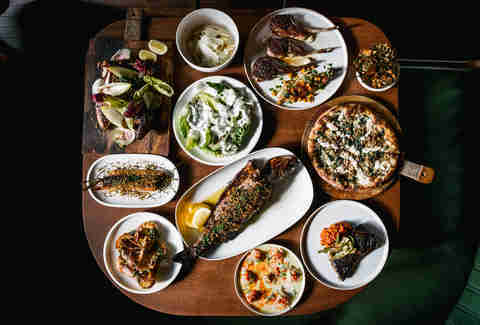 The most ballyhooed new restaurant in the sudden-dining-mecca of Coconut Grove is Giorgio Rapicavoli's Glass and Vine. Here you can sample semolina pancakes over baked eggs with Bloody Marys and mimosas, or pitchers of Sangria made with Vinho Verde sauvignon blanc. It’s called Taurus Beer and Whiskey for a reason, so don’t skip out on the all-you-can-drink bacon rye Old Fashioneds and/or Miller Lites for $19. The fried chicken sandwich on a Cheddar biscuit or the breakfast burger with sausage, cheese, bacon, and egg can soak up all the booze nicely. This Venezuelan hotspot with a menu the size of Caracas is going big on brunch with an overwhelming number of choices. Start with the list of cachapas and bolitos stuffed with pork belly, chicharrones, or ham and cheese. Then move on to huevos Benedictos with lomo saltado on top, or stick to the basics and get waffles or pancakes covered in Nutella and strawberries. If you find that you're stumbling out of E11EVEN around noon and want to feel a little better about yourself, head down the block to Fooq’s. The braised lamb and crispy rice is a hearty, savory way to start (continue?) your Sunday, and the choripapa with Proper Sausage chorizo, fried egg, and hand cut fries is almost like late-night food for breakfast. 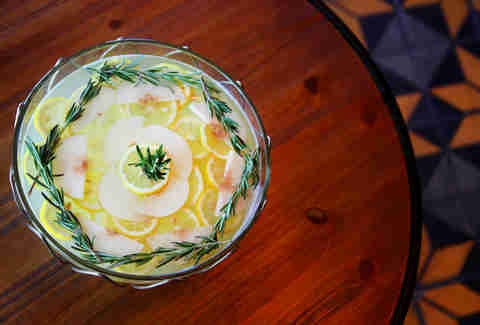 And if you want to keep the party going, opt for the bottomless white and rose sangria for $20. 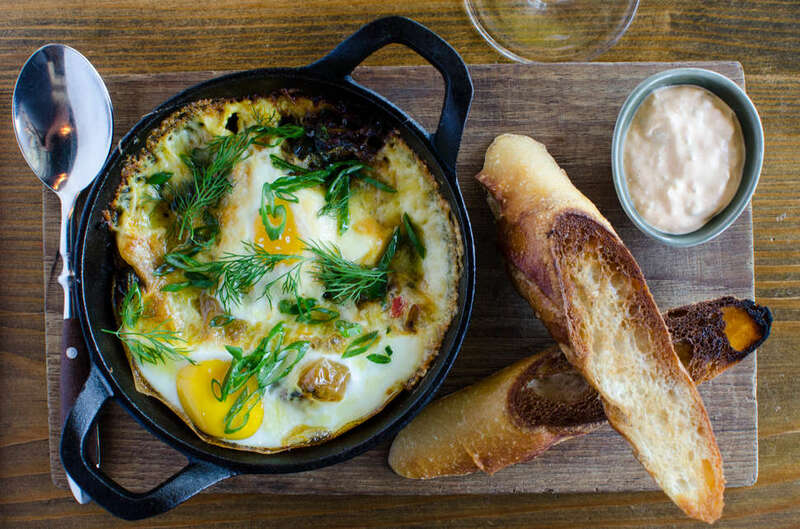 If you’re looking to splurge on brunch, nowhere in Miami is going to top Zuma. But even with the $95 price tag it’s a surprisingly good value, with unlimited Louis Roederer Champagne, a huge sushi selection, and a main course from a menu whose typical entree cost $45. Feeling super-fancy? Upgrade to bottomless Dom Perignon for $395. The famous Sunday Champagne brunch at the Biltmore is a Miami institution, and actually lives up to the legend. Caviar, smoked salmon, fresh carved steak, sushi, and a literal wall of desserts await inside the lavish Fontana restaurant. Then, of course, there’s the unlimited Champagne which is unlimited. And not that we told you to do it, but going into the requisite food coma by the Biltmore pool isn’t a bad way to finish off the meal. Miamians won’t line up for much, especially in stifling humidity. 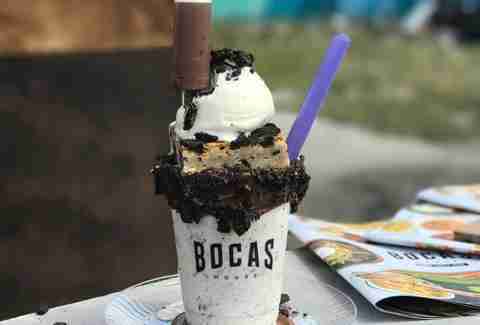 But walk by the corner of Calle Ocho and Ponce de Leon Blvd on a Sunday morning and you’ll see plenty of folks queued up for the Wakin’ and Bacon brunch, with favorites like Cap’n Crunch pancakes, carbonara eggs Benedict, and the special guava mimosa. 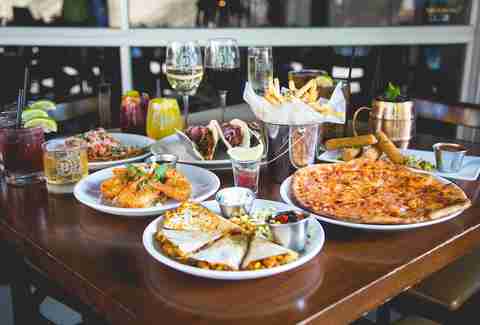 The hands-down biggest brunch party in Broward continues to be the one at Tap 42, where the sunny patio explodes with energy as guests enjoy bottomless mimosas, Bloody Marys, and UFO Harpoon whites starting at 11am. The food is nothing to ignore either, with white chocolate strawberry pancakes and filet mignon steak and eggs championing the menu. Another contender for biggest brunch party goes down at Himmarshee Village, where outdoor tables and pulsing music pour out of every restaurant on the street. Ground zero for the boisterousness is Public House, where football season brings epic watch parties, and the rest of the year brings a menu with dishes like s’mores-stuffed French toast and gingerbread pancakes, along with bottomless mimosas and Bloody Marys; $5 for ladies and $15 for guys. Arguably the most popular brunch among Miami locals (at least judging from the line that wraps around the patio) is at Morgans. This converted house serves up mascarpone and raspberry-stuffed French toast, a chocolate dipped waffle, and three different kinds of eggs Benedict along with other brunch favorites to make the wait worthwhile. And though there are no unlimited drink specials, if you’re more about eating than boozing for brunch this is your go-to spot. The restaurant that turned MiMo into a dining destination might be small, but it packs in one of the best brunches in the city. The legendary shrimp and grits are the must-have here, but the pulled pork Benedict and lemon buttermilk pancakes aren’t to be missed either. 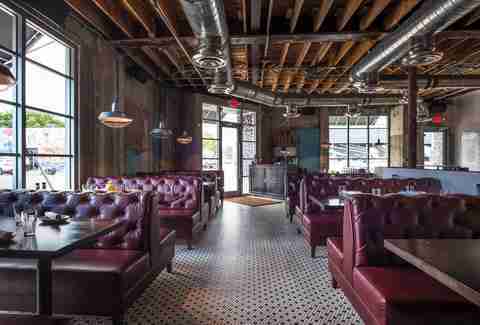 As a place known for bone-sticking comfort food and a hearty brunch, you’d be hard pressed to find a better option than Blue Collar. 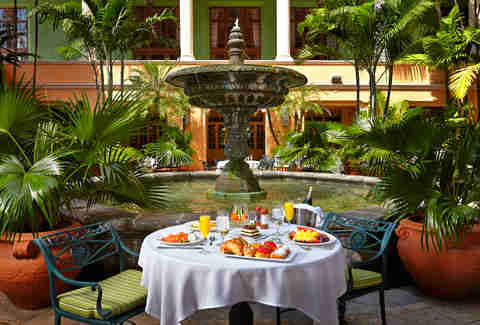 If the weather is cooperating, nothing is more relaxing on a Sunday than a leisurely brunch out on the patio at Mina’s. Here you can sip on bottomless mimosas and sangrias ($22) while enjoying traditional North African brunches. Try the Moroccan -- eggs baked with tomato, onion, pepper, and traditional spices -- or the Egyptian, with two eggs scrambled with cured beef fava beans, feta, and pita bread. South Beach’s original brunch party is still its best. 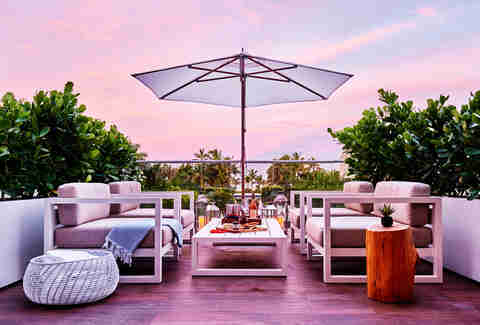 Lounging on the white chairs in the sand at Nikki Beach, enjoying chill-out music, pitchers of mimosas, and heavy doses of sunshine is the kind of experience that both locals and tourists can truly enjoy. And with an impressive spread of custom-made pastas, fresh-baked pastries, salad, and fruit, this Miami brunch legend still does it better than anywhere else. 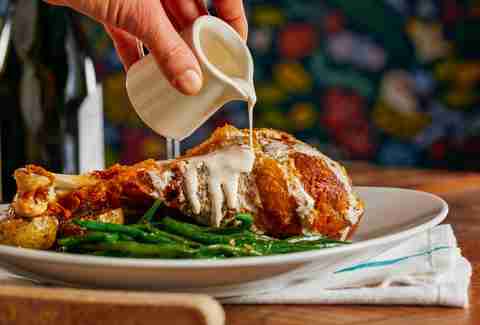 The Prime family of restaurants is no slouch when it comes to impressive food, and perhaps its crowning achievement is the brunch spread at Prime Fish. 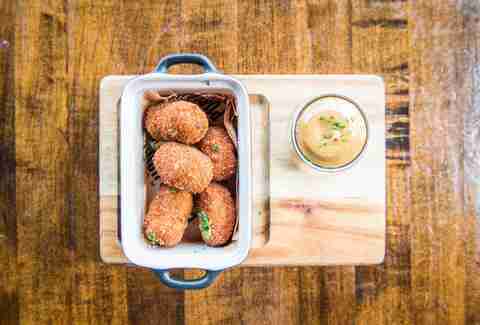 We’re talking curried fish cakes and duck confit hash, lobster omelets, homemade whitefish salad, brioche French toast, and eggs Benedict, as well as bottomless mimosas, Bellinis, prosecco, and house-made Bloody Marys. Some might debate the legality of charging ladies only $5 for bottomless mimosas and charging guys $15. But honestly, nobody’s complaining, especially when the menu at this burger palace has stuff like lobster corn dogs, a build-your-own Benedict bar with short rib and lobster, and a hangover sandwich with eggs, smoked pepper bacon, avocado, American cheese, and Sriracha aioli. Nothing makes a hangover feel better than a gigantic michelada with chorizo and jumbo shrimp. And, yeah, you’ll definitely find that at Tacocraft. But you’ll also find Miami’s best selection of breakfast tacos like the chorizo with Cotija cheese, potato hash, fried egg, cilantro, and garlic aioli. Or, for the more traditional, a hangover burrito with scrambled eggs, chorizo, tomato, avocado, Chihuahua cheese, potatoes, and crema. One of Miami’s most inventive new restaurants of the past couple years doesn’t let down with its brunch offerings. 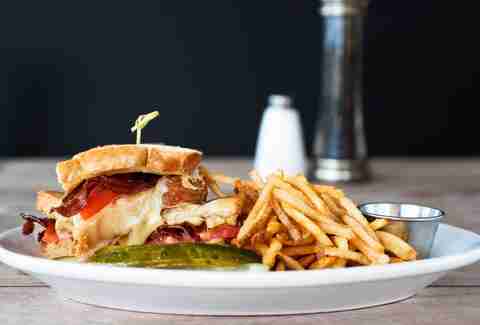 Try the waffle panini with pork belly rillette, swiss and maple mustard, or the croque madame made with oxtail and Gruyère on sourdough. 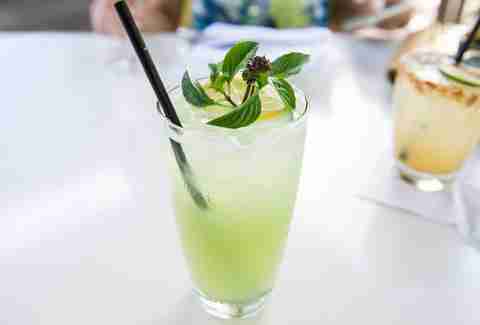 And since it’s one of Miami’s best cocktail bars, you should definitely skip the mimosas and try a specialty brunch concoction, like the Teenage Mutant Ginger Turtles. From a logical standpoint, diners should always have spectacular brunches. But when you can combine a place that has some of the best cocktails in the city with stuff like beef rib and cornbread waffles, you’ve got some serious, next-level diner food. If you don’t want to go meat crazy, there’s also a fried green tomato panini and churro waffles. And the Frose 10 -- Rutte dry gin, rose, Mandarine Napoleon, prickly pear puree, and citrus puree -- might be the best brunch cocktail you ever have. Jose Mendin’s new spot at The 1 Hotel is done up with open spaces and bright woods that just scream for daytime indulgence. That’s why Habitat has opened one of the most impressive brunch buffets in all of Miami, complete with raw bar, ceviche station, sushi, plus loads of pastries, fresh waffles, and pancakes. To wash it down, Habitat’s also got a custom Bloody Mary and michelada bar, included for $80, and unlimited as long as you’re at brunch (which is sadly only four hours a week, Sundays from noon to 4pm). Though it’s never a bad idea to enjoy food out by the spacious pools at The Confidante, sitting inside doesn’t seem so bad when you’re brunching on Richard Hales’ Southern specialties. 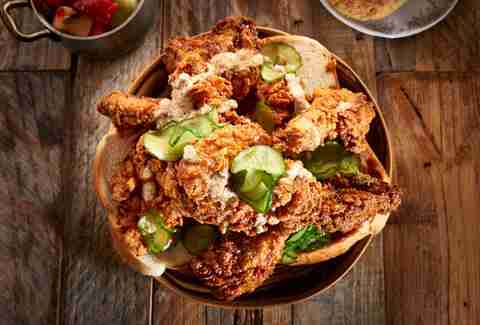 Of course you’ll need to try the hot chicken and waffles, battered in cayenne and paprika then topped with hot Chinese mustard, honey, and pickles. 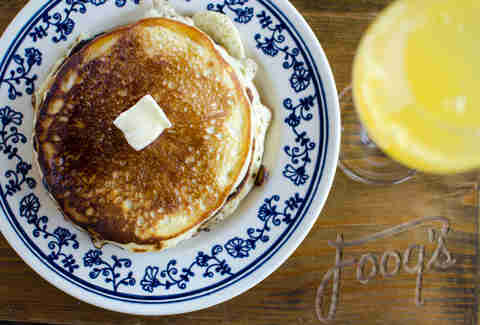 You also can’t go wrong with the sweet potato pancakes, or the breakfast tacos filled with fried chicken or skirt steak. If that line at Morgan’s is just a little too much for a hot, hungover Miami morning, head to the air-conditioned confines of Novecento’s Midtown outpost. 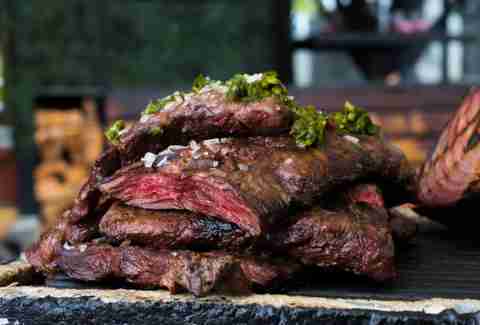 This Argentine brasserie’s go-to is the parrillada, where skirt steak, chicken, chorizo, and other grilled meats come with three sides. If loading yourself up with meat isn’t your idea of Sunday Funday, go for the brioche French toast or the smoked salmon bagel platter. No matter what you order, your first mimosa is free, and pitchers are only $28. Recently, you may have noticed people from Philadelphia tend to get a little excited about things from their hometown. Brunch at Parc chief among them, obviously, and the guy behind that Philly weekend favorite has set up shop in SoFi with the best brunch menu in the neighborhood. Stephen Starr is foregoing the buffet and instead focusing on a brunch menu that’s fantastic from top to bottom. 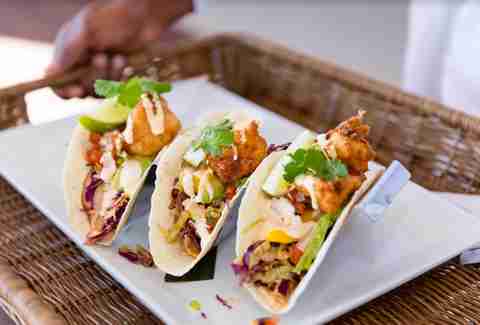 Start with the snapper crudo with tequila and lime, then move on to fresh acai bowls, then the spicy chilaquiles. You might not want to mute the taste with unlimited mimosas, Bloody Marys, and rosé for $26, but it’s one hell of deal if you do. The chef’s brunch buffet served by the Nautilus pool is reminiscent of the Shore Club of old -- an expansive spread full of flavorful salads, a savory carving station, and freshly baked pastries. The whole brunch is serenaded by a live Cuban band, giving it that “this could only happen in Miami” feel. The buffet by itself is $49, but for a mere $16 more you can drink all the rosé you want. Considering a single glass is sometimes more than that, it might be the best boozy brunch deal in the beach. Our pick for the best new brunch of 2017 was at this place, where $70 gets you a massive spread of fresh fruit, pastries, salad, and sushi, plus reign of a couple items off the a la carte menu including short rib empanadas or smoked salmon Benedict. Sounds pretty sweet until you sit down, look out at the pool, and see an entire freaking Argentine parrilla grilling steaks, sausages, and chicken that are all yours. You can add unlimited mimosas or Bloody Marys for $15, but with this much food, your calories might be better spent in solid form.